In April 2002, I was diagnosed with Non Hodgkins Lymphoma, STAGE IV. The Mayo Clinic's advice was "WATCH AND WAIT". I began searching to find ways to improve my health without resorting to chemo or radiation, in case my doctors should prescribe it in the future. I read various books on fighting cancer through diet and exercise. through my searching, I came to meet Emmy McCallister and Health Solutions. through this avenue I discovered Poly-MVA and have been using it along with MGN-3 plus a careful diet which includes vitamins for a two year period. The tests I have taken show good results. These include blood tests, MRI as well as CAT Scans. Another test I have taken or a regular basis is done by ONCOLAB called the AMAS Test. 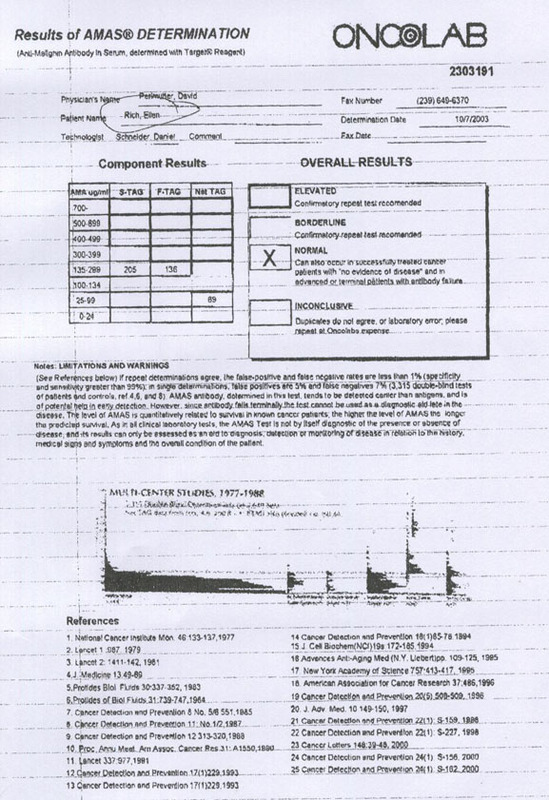 (Specifically designed to test Cancer) Each test was normal with the exception of one which was repeated and proved to be normal. Although I have enlarged glands throughout most of my body, the glands in my groin area are markedly smaller. I wish to thank you for the great and intensive work you have done over the years in perfecting Poly-MVA. I plan to continue using it and hope it will give the results I have enjoyed over the past 2 years.